Hyundai Spindle Repair and Rebuild at High Speed Technologies, Inc. is what we know, especially Hyundai Wia spindles used for turning or milling. Call 1-603-483-0333. Our OEM equivalent repairs come with a one year warranty. Our only business is repairing spindles and we have over 30 years of experience with precision CNC spindles. Our certified technicians will set preload, capture, balance and finish your spindle to factory new condition. Since 2000 Hyundai Wia has become South Korea’s largest producer of CNC machines. 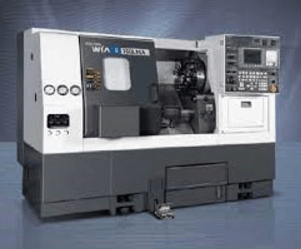 They offer a line of excellent vertical and horizontal milling machines as well as a full line of turning centers. The experts at HST can repair your Hyundai Wia spindle no matter what machine it’s from. If you need emergency repair for a production critical machine ask for our Quick Turnaround (QTA) service. Very fast turnaround, OEM quality repair without OEM pricing. The customer sent us this VX-400 mill spindle because it was making an unusual noise. He said it was still making parts OK running at 10 K RPM. It was good timing because when we received the spindle the shaft was very difficult to turn. Contamination had migrated past the front labyrinth seal and all bearings were in bad shape. Number 1 bearing also had fretting on the inner race that is indicative of a loose fit. Bearings from a VX-400. Note the fretting on the inner race of the #1 bearing and the severe contamination on #2. The spindle was completely rebuilt to our stringent standards. The end result was a fantastic running spindle. Vibration readings from the front of the spindle were excellent. Acceleration was 0.1141g and velocity was 0.0259 in/sec. When we opened up this Hyundai Wia lathe spindle we found the rear roller was still in good shape. But the front bearings were contaminated with tool coolant. Lathe spindles typically have larger bearings than most mills. And the cost of bearings seems to be exponential with the size of the bearing. So the driving cost on a lathe repair is the bearings. When finished this lathe ran like factory new. You can see tool coolant on the front bearing cover. The grease on the rear roller is still clean. However, it is our policy to never re-use bearings. All bearings were replaced. The timing pulley was worn so a new one was ordered and we bored it to match the original. When we were done the spindle performed like new. On the left is the Hyundai Wia lathe spindle as received. On the right is how it shipped. When we received this Hyundai Wia VX650 mill spindle it was completely seized. The reason was obvious once it was opened up. Contamination permeated the front bearings resulting in a catastrophic failure of the #1 bearing. A little contamination results in rapid bearing wear. The bearing wear generates more hard contamination. So once a bearing begins to fail it doesn’t take long until there is complete failure. Catastrophic bearing failure can result in other damage such as shaft galling and drive the repair price up considerably. So to prevent extended damage we always recommend scheduling machine downtime for repair as soon as unusual noise or vibration is detected. However, we understand that sometimes a shop has to do what a shop has to do and every little bit of production that can be squeezed out helps. Fortunately in this case the shaft was not damaged and the machine was back up and running like new in just a few days. Something missing? The cage from bearing #1 was totally disintegrated allowing the balls to fall out. The # 2 bearing is not far behind. A failure like this # 1 bearing can result in sudden shaft seizure and additional damage. This time we were fortunate. All new ABEC 7 bearings were installed with new drawbar springs and seals. When this job was completed the performance was excellent. Run-out at the taper was 1µm and at 300mm out on the test bar 8µm. The velocity reading on the front was 0.03407 in/s and the acceleration was 0.5707g. The Hyundai Wia VX650 spindle crated and ready to ship. Even after the repair is complete the spindle still receives special care. 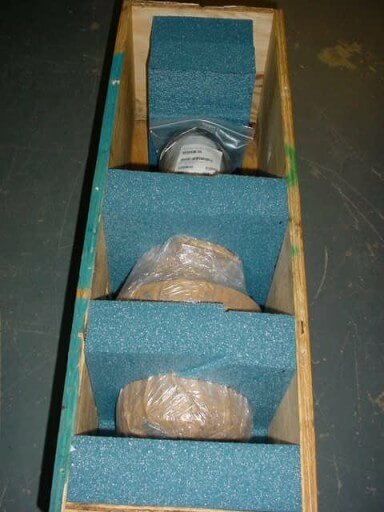 Preparing and crating a spindle for shipment is critical for proper operation and long life. Before we crate a spindle it is coated with a rust inhibitor and then wrapped in Cortec Vapor Phase Corrosion Inhibitor Mil-SpecB220119/020 material. The spindle is isolated from the crate with semi-rigid closed cell foam. Bearings can be damaged from vibration and jarring. This is particularly true with ceramic bearings. Spindle bearings are all preloaded. That is the balls and the races are already exerting pressure against each other. Sudden jarring of a stationery shaft can result in plastic deformation of the races called Brinelling. So it is important to make sure the spindle is supported by compliant material such as some sort of foam rubber and that it does not directly contact the hard surfaces of the shipping crate. Our business is spindle repair. That what we do. So if your spindle needs repair give us a call. If you call during business hours we’ll answer the phone. And besides being experts, we’re nice people to work with. Not all spindle repair houses are equal. Before you select a repair facility you should ask these questions.